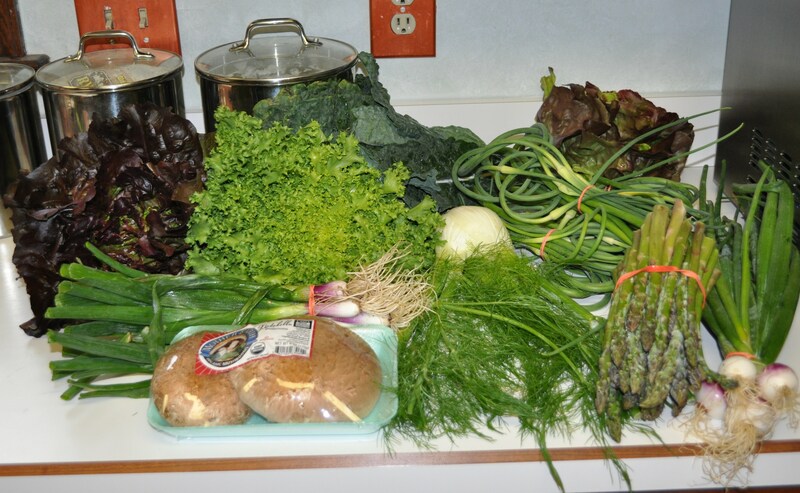 CSA Week Three. Greens dominant again, as this cool wet spring has been perfect weather for salad greens and cooking greens. This is what we got. This is what this morning’s email said we were getting. I included what the 60% share got this week so people can see the difference in the shares. The 60% share is a very good value if you like a bit of veggies, or are single or a couple who eats out often. There was a bonus in our full share. A bunch of young red onions. 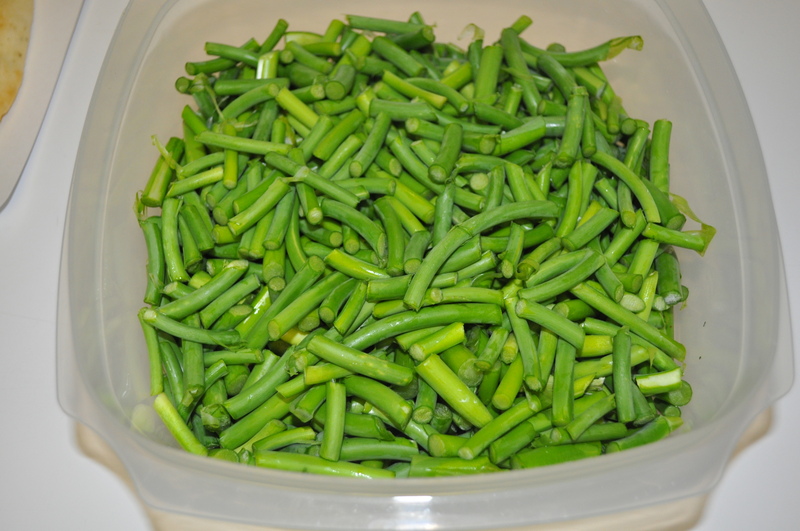 I swapped the cilantro, putiing it in the swap box and having another member give me her scapes. Later I realized she gave me both bunches, so I owe the site hosts some goodie from my kitchen to reconcile the swap box. They get to keep the contents of the swap box, and get a free share for being the host site. A bit of work, a few headaches from messed up shares by people taking the wrong things, but being a host is a good deal. If you like that swap box full of veggies noone else wants. I ended up with 27 of them in the four bunches. Cut up and ready to become pesto, along with the ones from Breezy Willow farm store. I will measure them out by the cupful and make pesto with them. Using slivered almonds, Parmesan, olive oil, salt and pepper. Most will get frozen for the winter. A few small containers in the fridge to use on flatbreads and pastas. I harvested mine today also. I got ten scapes. They will be grilled soon. As for dinner tonight, I used up some of my older stuff. Made a huge salad to finish the salad greens. 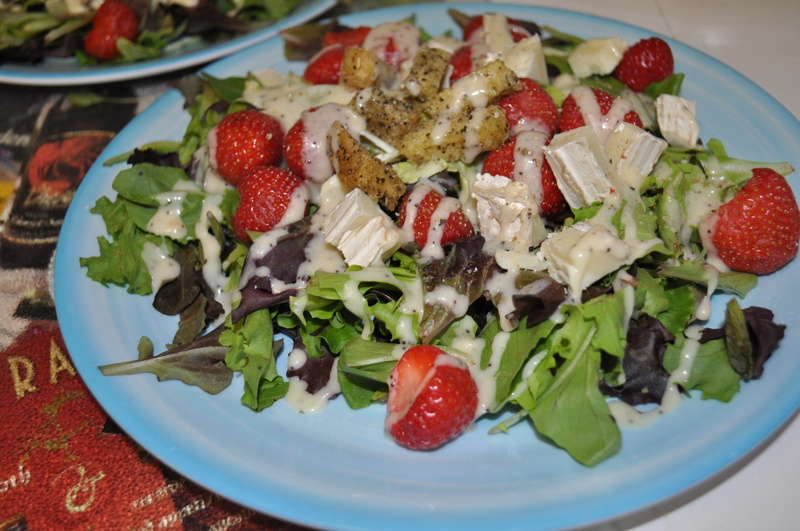 Larriland strawberries, cheese and Great Harvest croutons. Flatbreads. Two of them to slice. We will eat part of them and save the rest for lunch. The top one. Pesto and mozzarella. Fresh mozzarella bought at Breezy Willow Saturday. 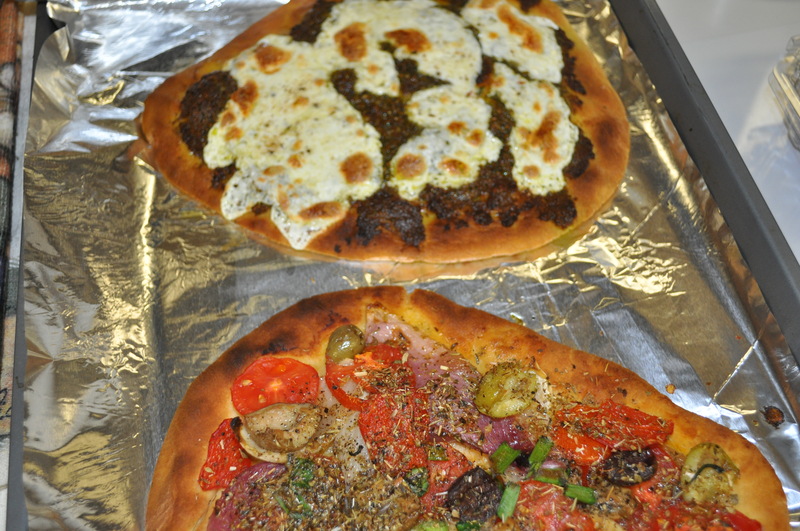 The lower one, herb roasted onions, Campari tomatoes, olives and scallion tops. Drizzled with olive oil. Baked at 400 degrees and finished under the broiler. CSAs are wonderful sources of the freshest veggies around. Now, I just need to find room for the new lettuces. Posted in CSA, Farmer's Markets, Food, Gardening, Locavore and tagged cooking, CSA, farmer's markets, Food, foodie, gardening, local businesses, Locavore, real food. Bookmark the permalink. I need to find room for more lettuce, too! I managed to turn almost all of the bag of kale into 3 pizza doughs and a soup, which reduced the volume considerably, but wow a produce section exploded in my fridge. 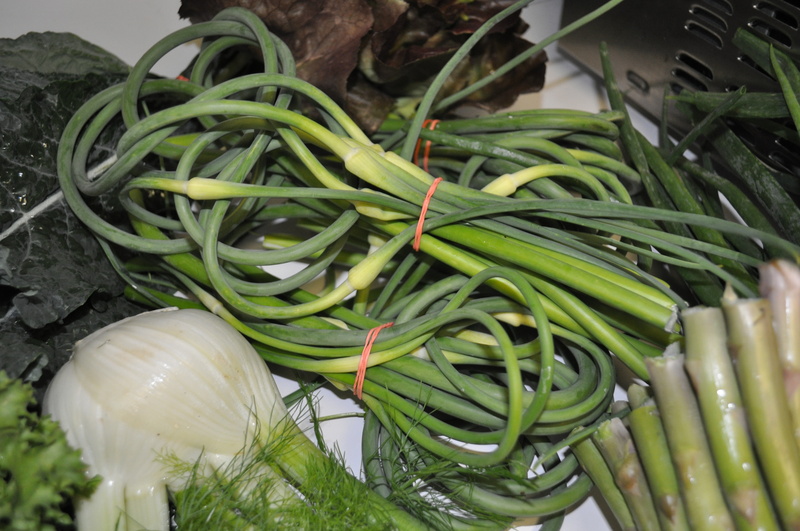 After nearly 3 years of subscribing to a CSA, I have yet to receive garlic scapes. I am so intrigued. Looks like you have more than enough to go around.